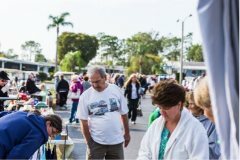 Tara Woods recently held its Annual Yard Sale. The crowd was huge, and the community was besieged with shoppers hoping to score a good deal. Some made multiple trips to their vehicles with their newfound treasures after a day of serious bargain shopping. Resident Bill Black served breakfast and lunch for a small fee. Many thanks to Bill for taking on this task.